I want to start off by wishing each and every one of you an amazing 2018. There are going to be a lot of bread recipes coming up. I made focaccia over and over again while trying to get a new recipe to work for me. This Tomato And Smoked Olive Focaccia was the second attempt. Before I get on to the recipe, let me look back and reflect on 2017. Dave and I travelled this year both for pleasure and for motor racing. This year we raced in Welkom, East London and Port Shepstone. Our last away race together was at Kyalami and then Dave went alone to Port Elizabeth. We also took a day trip to Knysna to see his mother who is 98. We went with friends to Fraai Uitzicht for a night to celebrate our wedding anniversary. And another day trip to the Nuy Valley with my parents. Our first overseas trip started in Rome on Easter Friday. From there we went to Sardinia and then on to France. In October we headed off to England and Scotland. Work was fairly quiet this year with no major movies being made. We are busy enough to maintain our lifestyle and for that I am grateful. We had house guests this year from Australia, Zimbabwe and Johannesburg. My parents came to visit for 12 days and we had a wonderful time with them. We ate out frequently this year at some great restaurants. On the house front we finished off the roofing and got the skeleton of the kitchen done. We also managed to finish the tiling. The pool deck was completed and looks amazing. There is still so much to do but at least we are making progress. I got to bake a lot this year. Some recipe testing was successful, but most was not. It just happened to be one of those years. 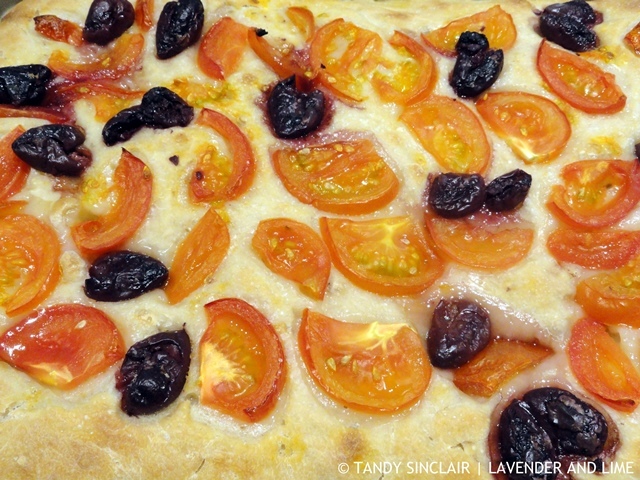 This Tomato And Smoked Olive Focaccia was a huge hit. Dave and I are on leave. We will be back at work on the 4th of January 2018. I have not made any resolutions this year, did you? this sounds incredible! i love olives (i sneak them from the fridge plain), and tomatoes are so tasty roasted, so i can just imagine how irresistible this focaccia must be. I can eat olives by the handful. Did you know that they should not be kept in the fridge? That’s all we did for 12 days! When I saw you post this on Facebook, I swooned. 🙂 It just looks so simple yet delicious. This looks fabulous, Tandy. I must read the instructions for my new bread maker and see if I can make this in it. Terence remembered what I wanted. If you don’t have a recipe for focaccia let me know. I have one on my blog. And so glad he remembered.